Guest Column: What is Too Much? Nathan Skytta pops back in to give us his thoughts on blows to the head in the NHL. Since the early days of the National Hockey League, the sport has been known for its intensity and its feistiness, but since the turn of the decade, the intensity in hockey has increased dramatically. There comes a point in time when the league has to draw a line between right and wrong. On Feb. 21, 2000, Marty McSorley, while playing for the Boston Bruins, swung his stick with three seconds left in the game and hit Donald Brashear, who fell backwards and hit his head on the ice and sustained a Grade 3 concussion. During a Sunday afternoon game on March 7, this year, Pittsburgh Penguins forward Matt Cooke hit Boston Bruins Marc Savard in the head with a shoulder check. Savard sustained a concussion and has not skated since. He is missing key games for his team as they fight for their lives in the NHL playoffs and yet, Matt Cooke is able to play for his team in the playoffs. Something is just not right about that, and the NHL commissioner’s office needs to set forth rules and regulations when it comes to blow to the head. Hockey players are becoming faster, more skillful and bigger, and there is no way the equipment provided can protect the players from the vicious blows and hits that their body takes during a game. As it is now, there’s a higher risk of injuring a player by blindsiding them against the boards or even while they are skating across center ice. An unwritten rule in hockey is that a player is not supposed to skate through the center of the ice with their head down. Doing this may lead to a crushing hit from an opposing player or a turnover — both things a player carrying the puck would prefer not to happen. Right now, there is no rule in hockey that says hits to the head are illegal, but many players have been fined and sometimes suspended for their rough play. This punishment hasn’t stopped players from putting an opposing player into the boards. The NHL needs to implement a rule against blows to the head before it’s too late and before someone gets permanently injured from a cheap shot. 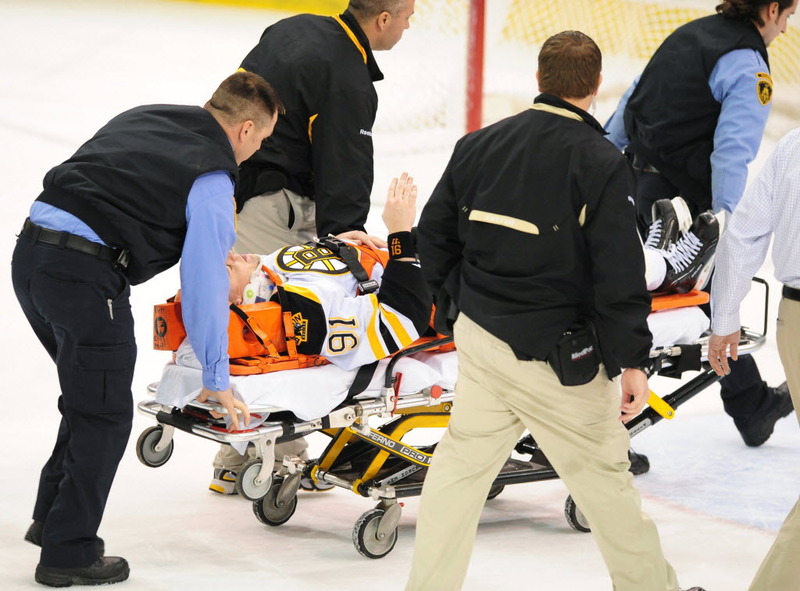 Marc Savard was carried off on a stretcher after being hit in the head by Matt Cooke. Out of the four major sports, those being the NHL, NBA, MLB and NFL, the NHL need the rules for blows to the head the most. In the MLB, if a pitcher purposely throws a pitch at the head of an opposing player, odds are they will be ejected and suspended for at least one start. In the NBA if a player hits an opposing player in the head, odds are they will be suspended as well — just ask Kevin Garnett of the Boston Celtics, who is missing game two of the NBA playoffs because he elbowed an opponent during an altercation. In the NFL, the league has done everything possible to make the helmets as “concussion-proof.” Hits to the head in the NFL, especially on a quarterback, are illegal and can cost a player some dough and some time off the field. The NHL and the NHL Players’ Association need to sit down, clearly look at the risks of blows to the head and realize that they are putting the player in danger every time a player is against the glass fighting for a loose puck. Yes, big hits are good for the game and get the fans out of their seats and onto their feet, but what the NHL needs to figure out is what is too much. Currently, there is a temporary ruling that allows the league to punish players for hits to the head on unsuspecting players, but that only lasts until the end of the season. The league needs to be stronger on the punishments. Cooke was allowed to return to the ice after a two-game suspension for his hit to the head of Savard, but Savard has not played since. The suspension process needs to be changed in order to make the player think about hitting an opponent in the head. If a player purposely hits an opposing player in the head, have different suspension lengths like the MLB has for steroid users. The first time a player hits an opponent in the head, or even up high, suspended him for two or three games and fine him a certain amount. If that does not teach a player to control his antics on the ice and he hits another opposing player, then suspend him for fifteen or twenty games and have him meet with the commissioner and the league before returning to the ice. If the player then commits the actions again, then suspend him for the rest of the season. Hits to the head can be not only career-threatening but possibly life-threatening as well. Detroit Red Wings defenseman Andreas Lilja missed almost the entire regular season, and a year of hockey, after sustaining a concussion during the 2008-2009 hockey season. It took Lilja almost an entire year to recover completely and to regain the strength and courage to step foot on the ice again. Who knows if the hit that Savard took will end his career or not, but if the league had a concrete rule about hits to the head, then maybe Savard could be helping his team right now in the playoffs and not wondering when he will be able to play again. The NHL needs to sit down and clearly look at all its options. Do they want the game to continue on the path it’s on now and have the chance of a player getting injured, or do they want players to have to suffer the consequences of blind-siding an opponent? The NHLPA is fully onboard with implementing rules that involve hits to the head. Now the NHL needs to get on board and come up with something before it is too late.